Intimate solo piano for a late evening's contemplative peaceful listening, as the Night's Soft Tide gently enfolds you. Let the Night's Soft Tide gently enfold you with Tim Fatchen's peaceful and serene piano performances. Reflective, introspective, passions muted, not without a degree of melancholy and yearning, but also with moments of uplift, romance and sentiment. Nocturnes, barcarolles, mood music--and midnight waltzes, the heartbeat of the Universe. Music for a late evening's contemplative quiet listening and relaxation, as the Night's Soft Tide gathers about you. 1. HEART CHORDS (3:19) Peaceful, rippling, shimmering, romantic, emotive nocturne. The "Heart Chords" are the lovely Eb, Db, and Ab majors, and almost all the harmony is built around them. The progressions will seem familiar: that's because a lot of New Age music use them, particularly Mike Oldfield, but you also find them in folk-pop, most outstandingly in the famous "Morning Dew" (Bonnie Dobson). 2. ENTR'ACTE - THE NIGHT'S SOFT TIDE (2:46) Gentle, yearning, introspective, melancholy: a short pensive chordal introduction brings you to the romantic nocturne-waltz of the title song. 3. OLD COUNTRY GRAVES (1:55) Heartfelt, forlorn, sad and lonely: the abandoned graveyards of the dwindling and disappearing small country towns. 4. AT THE HIGH PLATEAU'S EDGE (2:07) Serene and expansive. On the edge of an alpine plateau, looking down a mile, looking away forever. 5. SOFTLY TURNING SIXTY (2:19) Emotional, sentimental--bittersweet perhaps. Introspective piano with moments of passion, remembering and saying goodbye. Romance and memory and a sense of stoic loss. 6. ON THE NIGHT FERRY (2:23) Bittersweet longing, chill and reflective: a slow wave-lifted riding on a gentle oceanic swell. Written while watching the night wake of MV Astor on the edge of the Southern Ocean. 7. NIGHT MIST (2:32) Dark, peaceful, yearning: pensive piano, misty and slow, with repeated motifs and harmonic changes. 8. A WALTZ FOR SPRING'S DAWN (2:55) Uplifting, expansive: a classical waltz with a flowing backing behind simple heartfelt themes, from a serene and peaceful start to a passionate then accepting end..
9. WAITING IN THE AUTUMN LANE (2:19) Calm, peaceful, a little melancholy, to go with autumn skies and closing-in leaves. But there's a lovely swing to it nevertheless! 10. THE MOON THROUGH THE SKYLIGHT (2:43) Reflective, meditative, irregular, simple, uncluttered: slow night-time piano with brief ripples of light through slow themes. 11. SOFT SEA SKETCH (4:25) Chill and laid-back, rolling and floating. A barcarolle rhythm with a slow theme, evocative of oceanic swells in a quiet evening. 12. NIGHT THOUGHTS: THESE TEN YEARS PAST (3:38) Weary, regretful, introspective--but also calm and peaceful, delicate and sensitive. Pensive quiet piano, slowly pondering what went wrong before moving on, to an acceptance with a small sparkle. The past wasn't all bad! 13. ONE MORE WALTZ (1:37) Optimistic, upbeat, uplifting. A classical quick waltz, happy in a stately way. A wonderful wedding or circular waltz accompaniment! Who can resist one more waltz anyway? 15. BEDTIME STORY (2:58) Gentle, romantic and sentimental, with soft harmonies and simple patterns--bedtime for the children. 16. SECOND WALTZ (1:48) Romantic, a little melancholy: a passionate waltz in a largely minor tone but with a positive ending. 17. AT THE REFLECTION POOL (2:02) Meditative, serene, uplifting and a little sentimental. These reflections are worth embracing. 18. EVERYBODY NEEDS A WALTZ (1:55) Old-time feel-good, happy and uplifting: of course everybody needs a waltz! The heartbeat of the Universe! And it's another wonderful wedding waltz, too. 19. AUTUMN DRAWING IN (2:33) Rippling, a little melancholy but accepting. Autumn is always both a joy in its fruitfulness and a sadness as a harbinger of endings. 20. CODA - CURTAIN (3:06) All things end. We may concentrate for a short while on a coda to our experience, but then the curtain must fall. Not without a last flourish and bow and wave, though! ...AND A THANK-YOU TO THE PATRONS: The production of this CD/Album has been made possible through the active support of Tim Fatchen's lovely Patreon Patrons (Sustaining Patron: Alli Pollard.) Without them, it wouldn't have happened. Straight up, full disclosure: this album is dedicated to me. However, I didn’t know that when I first heard it, and the dedication doesn’t change my critical opinion of the album in any way. 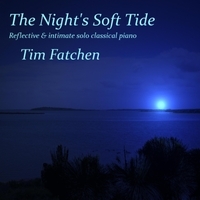 Rather, it makes me incredibly proud to be associated with The Night’s Soft Tide, as I believe it to be, in all seriousness, the best piano album Tim Fatchen has ever released. I have been both a fan and a friend for some time, and when Dark Sparkles was released in 2011, it was the album I couldn’t stop talking about. But with The Night’s Soft Tide (2017), Fatchen has succeeded in putting himself into the music completely, resulting in a beautifully evocative concept album. Fatchen’s talents are diverse, ranging from library music to, most recently, an epic opera based on South Australian Aboriginal mythology, entitled Ngurunderi. Although it’s a risk to make presumptions about other artist’s creative ideas, I would venture to guess that Fatchen may consider himself to be a neo-classicist at heart. If he doesn’t, then he’s completely fooled me with this album. Although the neoclassical label is often overused in an attempt to avoid having one’s music labelled as elevator muzak, it was first coined during the period between the World Wars in the 20th century, as composers looked to the past in an attempt to find a way forward, past the unimaginable horrors of war. None of the tracks on Tide are strictly classical, or even ‘new’ classical, because of Fatchen’s enormous versatility. Listen carefully and there are echoes of Philip Glass, Claude Debussy, and even Aaron Copland. But then there’s the wonder of everything else: the tiny jazz chromaticism inserted at the beginning of ‘A Waltz for Spring’s Dawn’, or the hint of a children’s folk song tucked into the introduction of ‘Bedtime Story’, or the persistent pentatonicism of ‘The Moon Through the Skylight’, or the Scottish folk ‘feel’ of ‘Soft Sea Sketch’. Even when actively listening (a skill that seems to be falling by the wayside as everyone seems obsessed with the necessity of multi-tasking), you may not notice where one track ends and the next begins. Whether by accident or design, this allows you to be drawn further deeply into the music. The Night’s Soft Tide is a journey that will change each time you listen to it. Tim Fatchen has created one of the most evocative albums of all time, because the music not only brings you his thoughts and feelings, but digs deeply into yours. By the time I reach ‘Coda - Curtain’, I am usually in tears. I hope you will be as well.